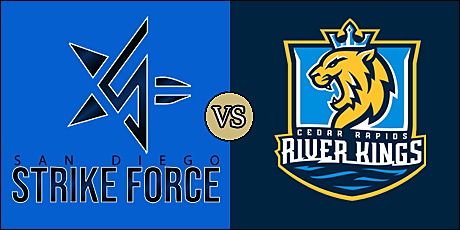 CEDAR RAPIDS, IA - The Cedar Rapids River Kings scored 21 straight points over a seven-minute stretch of the third and fourth quarters to pull away from the San Diego Strike Force and earn their first win of the 2019 Indoor Football League season tonight at U.S. Cellular Center. The 65-48 victory improved the River Kings' record to 1-2 on the season, while the Strike Force stand at 0-3. The teams will meet one other time this season, on April 14 in San Diego. San Diego struck on its opening drive when George Moreira rushed into the end zone from a yard out. The River Kings came right back to tied it on Jordan Smith's six-yard pass from Kurt Palandech midway through the opening quarter. Ernesto Lacayo's 31-yard field goal lifted the Strike Force to a 10-7 lead. Palandech found Smith again; this time for 14 yards as the River Kings took a 14-10 lead into the second quarter. After a goal line stand by the Cedar Rapids defense, Palendech hit Marquel Wade on a 30-yard catch-and-run touchdown and the River Kings were up 21-10 with just under nine minutes remaining in the first half. San Diego narrowed the lead to 21-17 on Julian Stafford's one-yard touchdown strike from Derrick Bernard. The River Kings came right back as Wade ran the end around to the left side to make it into the end zone. The Strike Force added a 21-yard field goal from Lacayo and the River Kings lead was 28-20 at intermission. Kaliff Phillips' four-yard run gave the River Kings a 34-20 lead to open the third quarter, but the Strike Force came right back with Moreira's 12 yard scamper and the score was 34-27 with 8:46 left in the quarter. Cedar Rapids took a 41-27 lead on Nathaniel Chavious' one-yard run, and extended when Palandech found a wide open Phillips for a 28-yard touchdown bomb. The River Kings led 48-27 after three quarters. The River Kings went up 55-27 just over a minute into the fourth quarter on Chavious' three-yard run, but the Strike Force came back on a wide open 32-yard QB scramble from Bernard. Henry Nell's 19-yard field goal extended the Cedar Rapids lead to 58-34 with 8:50 left in the fourth. Marques Rodgers rushed from five yards out to narrow the Strike Force deficit to 58-41. The River Kings went up by 24 on Chavious' one-yard run with 2:47 left. San Diego scored one more time, on a Bernard 40-yard bomb to a wide-open Julian Stafford to account for the final tally of 65-48. Cedar Rapids dominated most offensive categories, including total offense where they outgained San Diego, 320 yards to 242. That included an advantage in rushing, 177 yards to 67. The Strike force were penalized 10 times for 153 yards and the River Kings were flagged seven times for 44 yards. The Strike Force committed the only two turnovers of the game; an interception and a fumble. Neither team recorded a sack in the game. Palandech had an excellent game, completing 13 of 17 passes for 143 yards with five touchdowns. He also rushed eight times for 59 yards. Chaviousrushed a dozen times for 75 yards with three trips to the end zone. Wade caught six passes for 51 yards, while Smith had five grabs for 50 yards. Each receiver hauled in two touchdown passes. Defensive back Tavion Garrison recorded 7.5 total tackles and 1.5 tackles for loss. Ricky Johnson had an interception and three pass break ups, and his cousin, Travonti "Tuff" Johnson, recovered a fumble. Bernard looked good at times, but seemed to struggle most of the way. He completed just 12 of 32 passes for 172 yards with two touchdowns and a pick. He also rushed for 35 yards and a score. Moreira finished with 11 carries for 26 yards and a pair of scores. Stafford caught four passes for 75 yards and two touchdowns, and David Carter had four receptions for 56 yards. John Roberson paced the Strike Force defense with eight total tackles, and Kenric Young, Jr. added seven of his own. The River Kings will host potential new geographical rival on March 15 with kickoff set for 5:05 p.m. pacific (7:05 p.m. central). The Strike Force have a bye in week 4 before returning back to action on March 24 when they host the Green Bay Blizzard. Kickoff for that one is scheduled for 3:05 p.m. pacific (5:05 p.m. central). Good for Cedar Rapids to get their first win. I can see them making some noise.